How can we get the email in the same format as the submitted form? You could change your form to match any design that you are after and simply output the field values where needed. It will however display the submitted data in a list (as you have seen). 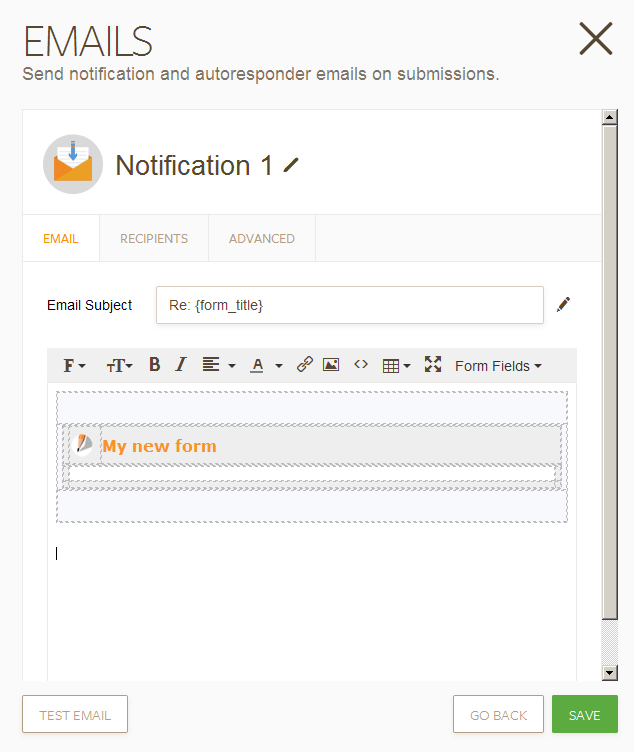 To change it, simply open the email notifier / autoresponder and edit its body. Once you click on save, it will be saved and used from that point on with your own design. Using the toolbar at the top, you can quickly change the layout and the style of each segment of your email, while Form Fields dropdown button in the right corner will allow you to add the field tags in right location so that you can show the submitted values. It is good to point out that form online and form in the email will be much different. In general you should expect that some styles are removed from email - by your email client. And since there are many different ones, it would not be possible to set it all up for each (so that it looks like the form where js could run as well does).